* Giuseppe’s Cafe, 67 South Federal Highway, Boca Raton, Floria 33432, (561) 235-5039. 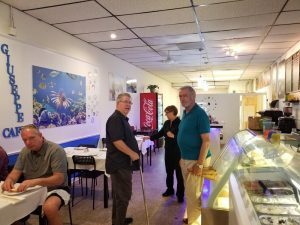 In recent weeks, Jeff Eats has been hearing some absolutely dynamite things about a “mom & pop” (actually in this case- a husband & wife) hole in the wall Italian joint- named Giuseppe’s Cafe in Boca Raton. I haven’t eaten there yet, but I have walked by-the-joint several times and “hole in the wall” is being kind…maybe 6 tables and a few display cases for gelato and various baked goods! Jeff Eats got plans to eat there in the near future, but in the mean time- I’m kinda thinking that some of you guys might like to check out this joint which supposedly serves up amazingly delicious salads, sandwiches, paninis, pastas, entrees, gelato and desserts! You can check giuseppegelatocafe.com for menu/info. 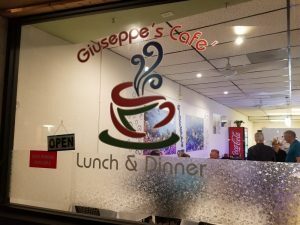 Giuseppe’s Cafe is open Monday-Wednesday, Friday 11am-9pm, Thursday 11am-4pm, Saturday 5pm-10pm, closed Sunday. My husband and I have eaten dinner at Giuseppe’s 3x and I have to tell you that its food is incredible. The restaurant is a no frills deal with no liquor. You can bring your own booze. It is run by a husband chef and a wife waitress/front counter period. Ive lived in Boca Raton for 31 years and I have to rate this joint as one of the best Italian restaurants that we’ve been to in s Florida. You have given your readers an absolute gift on this one. Guaranteed when you eat there that you will love it.